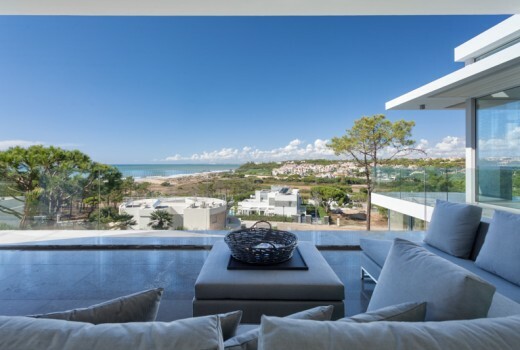 Luxury 4 bedroom villa located in a peaceful area in the exclusive Pinheiros Altos resort in Quinta do Lago. This property enjoys beautiful views over the golf course and Ria Formosa. The imposing entrance hallway features a a double sweeping staircase and guest cloakroom. Doors lead into a spacious living room. The fully equipped kitchen is fully fitted with an adjoining utility room. There are two bedrooms on the ground floor. The master suite, as well as a guest suite, are located on the upper floor. Both levels boast sunbathed terraces with sweeping views. A large basement area and an external garage are also features of this well kept property. The beautifully landscaped garden and spacious pool area have been designed to optimize outdoor style and comfort, offering hours of sunbathing. An additional terraced area is complete with a barbecue to make the most of the sunny Algarve evenings.